Will my belongings be safe there? Is the location convenient to my home or place of work? Do they have the size and type of space I need? Is the rental rate amount fair for the storage benefits I am receiving? Are all self-storage centers the same? No! Storage centers range in age from brand new to 30+ years old and will vary in the types of features offered. For example an older center may be built of wood and require you to carry items upstairs, while newer centers are usually built of steel with hospital sized elevators. Security is an important factor you should ask about when selecting storage. Location is also important. Some Santa Barbara and Goleta storage centers are located in industrial areas and others are more conveniently located near your home or place of work. Cleanliness is also a big factor so you should visit the storage center before you rent. Will my items be secure? Patterson Plus is equipped with video cameras inside and outside the buildings. Other security measures include electronic gate access, perimeter fencing, alarmed building entrances for client access only, shared on site resident manager with Patterson 101 Self Storage and well-lit so you feel comfortable accessing your items in the evenings. In addition, The Carey Group’s corporate offices are located on site. All clients provide their own locks for security purposes. We recommend either a disc or cylinder lock and both are available in our box supply store or you may purchase one at a local hardware store. 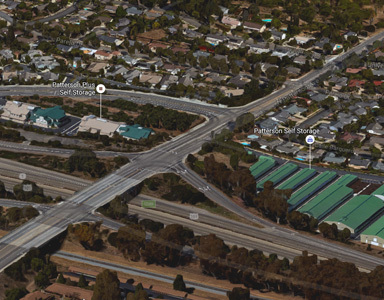 We are conveniently located right off Highway 101 at the North Patterson Avenue exit on Calle Real. Just up the road from Starbucks and Trader Joe’s. What hours can I access my belongings? With your personal gate code you can access your items 365 days a year from 7am to 7pm (extended hours may be available for an additional fee – call 805-964-4097 to inquire). If I choose a second floor space will it be hard to access my belongings? Not at all, we have two hospital sized elevators that make it very easy, along with flat carts and dollies for your use. Can I make a reservation and fill out the paperwork on line? Yes, you can reserve a space for free and complete the rental agreement when you come to our office. To expedite your move in, call us with your information 805-964-4097 – and we will get the lease ready for your arrival! Yes. Please visit the Boxes and Supplies tab to view the items we sell. Our merchandise showroom is located at 98 N. Patterson Avenue and is open Monday through Friday from 9-6 and weekends from 9-4. How many boxes do I need for my size storage space? See our Packing Estimator on our Boxes and Supplies tab to help you calculate what you need. May I have items shipped to Patterson Self Storage? Yes, we offer receiving services. Upon completion of our delivery acceptance form, we can accept packages for you and hold them for up to three days (some fees may apply). Can you recommend a mover? We can provide you with a list of movers that our clients have used and recommend. These movers range from large to small and from local to national. Call or email us for the list. Why should I choose Patterson Self-Storage? Our property is immaculately maintained with full time technicians who take pride in making sure our property is clean and welcoming. They’ll even stop by your space to offer you ice cold water on a hot day! You will smile when you see them out polishing the fire hydrants! What type and size space do I need? We offer 5 types of spaces including saver spaces, traditional spaces, temperature control spaces, premium spaces and drive up spaces. View our Storage Types Glossary to read the detailed descriptions of the various types of spaces we offer. To help determine what size might be best for you, visit the Storage Sizes tab or call 805-964-4097 so we can help you personally. Our spaces have high ceilings ranging from 9’ to 15’, so when you rent with us you may be able to fit your items in a smaller space than you would need at other centers (for example if you want to store a 14 foot kayak we may have a 10’ x 5’ space with a tall ceiling which is less expensive than renting a 5’ x 15’ space)! What are temperature controlled spaces? These spaces are cooled in the summer and heated in the winter to take the highs and lows out of the temperature. Temperature controlled spaces are good for temperature sensitive items that could be damaged by severe hot and cold such as electronics and items made out of wood or plastic. Can I store a car, boat or motorcycle? Yes, we have drive-up spaces that will fit cars, boats and motorcycles. The vehicle must be in working condition and we require a copy of the current registration and insurance. A drip pan is required. Some of our spaces have trickle charger outlets. The lease term is month to month. Your lease period starts the day you rent the space. For example if you rent on the 10th of the month your next monthly rent payment will be due on the 10th of the following month. You can pay online, in person at the rental office, onsite at the drop box at the entrance keypad (no cash please), by mail or as most clients prefer, you can arrange to have your payment automatically charged to a credit card for our “No Late Fee Guarantee”. At move in we accept local checks (pre-printed with your name and local address), Visa, MasterCard, American Express, Discover, and debit cards. How much notice do I need to give when I am ready to move out? We require a seven day written notice to move out. Full details on the vacating policy will be provided for you at time of move-in. Rent is not prorated or refunded. Yes. Your stored items may be covered on your homeowner or rental policy or we offer Tenant Protection Plans. For additional information, please feel free to call us at 805-964-4097, email us directly at info@pattersonselfstorage.com, or use our contact form.